With the arrival of October, gardeners now feel that we are officially in Autumn. The mornings have a cold snap to them but the days can still warm up into the 70's or even 80's. This is a busy month for gardeners. Harvesting is wrapping up and cool season gardening is in full swing. This is an excellent time to plant. Unless a hard freeze has occurred, flower gardens should still look OK with some thoughtful pruning and clean-up of summer annuals. Watering is still essential and should be applied 2 to 4 times this month. Compost garden debris and leaves. 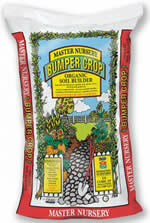 Plan to amend around existing plants, garden areas and lawns with organic products such as Bumper Crop and Paydirt. If you are a fan of Full Circle Compost products, their recommendation is BOOST your garden soil with a 1/4 layer and PROTECT over the top 1". This is the perfect time to plant garlic. Garlic survives bitterly cold winters, grows rapidly when the weather warms in the spring, and bulbs in the summer. Ideally it should be planted 4-6 weeks before the ground is frozen. We still have a great selection of bulbs - including daffodils, tulips, allium, hyacinths, crocus and specialty bulbs found only here. We are pleased to have added an Apple Press to our October schedule. The dates are Saturday and Sunday, October 22 and 23 from 10:00 AM - 3:00 PM. Prep your apples prior to coming, which includes washing and quartering them. It is not necessary to remove the core but do remove any worms. Bring a clean, empty container with a lid to take your cider home. It takes 14 to 16 pounds of apples to make a gallon of cider. That is approximately 36 apples. In October, Santa's helpers are busy transforming the inside and outside of Greenhouse Garden Center into a Christmas wonderland. Outside in the yard, our staff is busy getting our plant inventory ready for winter. October is still an excellent time for planting. Don't hesitate to ask our knowledgeable staff for assistance either inside or outside. What you are looking for may not be where you last saw it but we can find it for you. Greenhouse Garden Center is now taking reservations for our annual Landscape Design Workshop, which is a perfect Christmas gift for the gardener who has everything or the homeowner who is thinking about making landscape changes or landscape upgrades. Fall Festival sale, limited to in-stock outdoor plant material, pottery, fountains and statuary. Apple Cider Press, 10 am - 3 pm; apples must be washed and quartered, and you provide your own container with a lid. Call 882-8600 for details. Ornamental grasses are looking beautiful in the fall when their seed heads have matured. There are several varieties that are hardy for Northern Nevada. They also add a sense of motion to the landscape as they move with the wind. Ornamental grasses varieties can vary in height from a few feet to 12 feet tall. They can provide a nice winter interest if pruning is done in the spring. Greenhouse Garden Center has a great selection of ornamental grasses. WOW: Any person attending the workshop will receive 15% off any landscape plants purchased during the 2016 season. Lunch will be provided on Jan. 21 and Jan. 22. All classroom materials wil be provided. During this session, drip and sprinkler considerations will be further customized to each homeowner's needs. Also, lawn, soil conditions and amendments, fertilizers, plant care and watering issues will be addressed. In addition, hardscape landscaping such as pavers, patios, ponds, lighting, statuary and benches will be discussed. At the end of this session a discussion of tree and plant selection will be conducted with an onsite tour of the nursery to view various trees and shrubs. Autumn is a good time to prepare your lawn for the year ahead, and the best time to tackle any long-term improvements. Tasks such as raking out lawn debris, eradicating moss, feeding, and aerating will improve the quality of your lawn greatly if carried out on a yearly basis. Under some conditions, grass clippings and debris can form a thick "thatch" on the surface of your lawn. This affects growth of the grass and should be removed with a lawn rake. Raking also removes moss. If grass growth is poor, aerate the lawn. Prior to aerating, mow your grass one final time - short - around 1 1/2". We recommend using a powered aerator that actually pulls plugs of grass and thatch out of the lawn. These can be rented locally - or call us here at 882-8600 and we can arrange to come out and do that for you. Brush gypsum into the holes in areas of clay or poor drainage. Alternatively, in sandy areas, rake in Paydirt or Bumper Crop. October is a little late here for reseeding; however, sodding or patching with sod is fine. After you have completed all of the above preparations, it is time to apply your final fertilization of the season. We recommend a couple of different options for you. Our Easy Living Fall and Winter Lawn Food contains sulfur and iron both. If you prefer to stay organic, then Dr. Earth Lawn Food is a fine choice for anytime of the year. Because of the alkaline nature of our soil and water, we recommend additional sulfur and iron be added to all plant material, including grass, in addition to fall fertilizer. Dr. Iron or FST are great choices. Avoid Ironite in Northern Nevada as your supplemental iron and sulfur choic, because the percentages of these elements in the product are around 2%, which won't give you enough iron and sulfur. Finally, remember that water is still essential in October. At the beginning of the month, continue to water once a week. By the end of the month, if the night temperature is consistently below 27 degrees, the irrigation system should be winterized to prevent freeze damage. Autumn has arrived. Often, unknowing gardeners turn their irrigation systems off with the first freeze. Although it seems logical, this practice is not good for the health of your plants. Weather patterns in the fall vary from occasional freezes, particularly at night, to 60's and 70's in the daytime. Rarely do we have significant precipitation in October that soaks the ground, and it is a good deep soaking that is best for plants. Even though the temperature has dropped, the humidity is extremely low, the wind still blows and the sun is warm during the day. Plants continue to require water. Up to the last week in September, the weather was hot, so plants were using quite a bit of water. To suddenly stop watering will cause stress. A better technique is to harden off trees, shrubs, flowers and lawn. Hardening off means to gradually reduce the amount of water provided to your plants and lengthening the time between waterings. Ideally, especially with trees, water out to the drip line, the outer reach of the branches all the way around the tree, to a depth of 18 inches. Do this slowly so that water does not run off. Flowers have a shallower root system, so they do not need as deep a soaking. Depending on how hot the temperature gets, you should be able to water once per week at the beginning of October and by the end of October have extended that to once every two weeks. Keep in mind that new plantings will need more frequent watering. In November, December, January and February, plan to water once a month. Once the temperatures remain at freezing, sprinklers will need to be turned off and drained. To provide monthly irrigation means turning on the sprinklers again and then draining them again, or watering with a hose. The Greenhouse Garden Center staff is available to assist you with any questions or concerns, or to turn off and drain your irrigation system for you. Call us anytime at 882-8600. This is the best time of year to prepare your pond and fish so that next season will be a delightful ponding experience for you as well as your pond plants and fish. The most difficult - but necessary - job is to clean out as much of the dead leaves and dirt at the bottom of the pond as possible. If you have been netting your pond, put the net back over the pond when you have finished the cleaning process to prevent more leaves from blowing in and accumulating at the bottom of your pond. If left, the organic waste will start to rot without the benefit of oxygen. This will cause toxic gasses to be released into the water. This condition will kill fish and frogs in the pond if the pond freezes over. Simply by cleaning your pond and adding Microbe-Lift Fall and Winter Prep or Microbe-Lift PL and Microbe-Lift Sludgebuster and checking your pH, salts and nitrogen levels leave you prepared for winter. Trim back all pond plant foliage, including the waterlily leaves floating on the surface. Check to see if you have string/hair algae growing on the waterfall and stream bed. Treat this with an algaecide to keep the pond clear for the winter. Stop feeding the fish. If your fish were ill during the year, add pond salt to .25% for the winter or 1% for 2 weeks, and then change the water to lower the pH levels. If your pump is in the bottom of the pond, raise it closer to the surface and leave it about 1 foot below the surface. This helps keep the warm water on the bottom of the pond and fish happier. Leave your pump alone if it is in a skimmer. Remove any UV lights and products that are hard plastic, which may freeze and crack if frozen during the winter. If you are not planning to leave the pump running through the winter, install a pond heater, which will keep the ice open and allow toxic gasses to escape. Spray your junipers and arborvitaes with Lily Miller Microcop to control a fungus which attacks the tips of the plants. If you are noticing this problem, you will need to spray again in November. Gradually add 1 cup of the shredded cheese.